Here is a single Euro pillow shams with hem stitched border. Made from 100% cotton linen. Size for the pillow without the sham is 26 by 26. Monogram will go in the center of the pillow and will be done as large as the photo. The size of this font ( interlocking) is 10 inches. No forms are included in this order. It is only for the monogrammed Euro Sham with the large monogram. 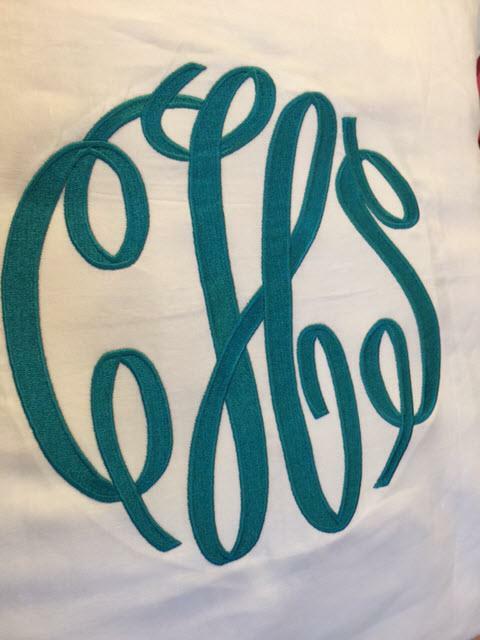 The picture shows a Euro sham with a dark teal monogram done in the interlocking script. The pillows shams will measure for a Euro 26 by 26 inch pillow form. The best way to wash these pillow cases is the hand wash and line dry. Please iron on the reverse side to protect the monogram and make it come our smooth after cleaning. Customer ratings: 8.0 out of 10 based on 1 ratings. In stock! - Browse this brand: The Pink MonogramOur products are custom made to your specifications. This product ships up to 2 weeks after your order is placed. Nick Name: Meg location: SC Date: 2014-07-30 13:39:29 Purchased these right after I got married to update all of my bedding with my new monogram. This was by far the best price I found and they are great quality!